Patrick and Lisa Noland-Shalosky are a husband and wife team who are changing lives through spirit connections. Lisa is a Psychic Medium, Certified Spiritual Advisor and Certified Master Teacher through the Lisa Williams International School of Spiritual Development (LWISSD.com) as well as a Trance Channel and Certified Spiritual Hypnotist . 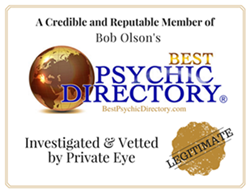 As a Psychic Medium, Lisa receives messages from beyond in many forms, including clairvoyance (clear seeing), clairaudience (clear hearing), clairsentience (clear feeling) and physically using psychometry (sensing a physical object like a piece of jewelry or clothing or holding a photo) or by simply giving her a name. She can connect you with loved ones who have crossed over and are now in spirit form. She is also able to connect you to your spirit guides, angels and light beings. Do you have unanswered questions regarding a loved one’s passing? Are you considering a career move and need direction? Are you seeking guidance from a higher power? Do you have questions about a relationship or love interest? Do you feel stuck and are unsure which way to turn? Don’t miss this opportunity to get the answers you’ve been seeking!!! As a Trance Channel, Lisa invites spirits or entities from the Angelic and Universal realm to “borrow” her body for a matter of time in order to communicate with the living. Lisaholds a Group Trance Channel session on the 2nd Friday of every month. During the Group Trance Channel an open message is given to everyone in the group then all participants are allowed to ask one question and receive an individual reading from spirit. In past trance channels, such beings as Gaia (Mother Earth), Kuan Yin, Mother Mary, Arch Angels, the Sun God Ra among others have come to deliver messages. As a Spiritual Hypnotist Lisa and her husband Patrick will take you on a journey inward and help you discover the healing power of the sub-conscious mind through spiritual hypnosis. Services offered are: Past Life Regression, Back-To-The-Cause Past Life Regression, Soul Mate Hypnosis, Soul Retrieval, Parallel Lives and Soul Group Hypnosis. See Services and Rates tab for detailed descriptions of each service. Lisa is a Diamond Psychic and contributor to the Bellesprit Magazine at www.BelleSprit.com. Dictations of Gaia's channeled sessions from previous monthly groups have been published and shared in this beautiful on-line magazine under the heading Spiritual Growth presented as "A Message from Gaia". Lisa is available for Private Readings (in person, via phone, FaceTime or Skype) and for Group Parties or Corporate events. Gift Certificates available upon request. Patrick is a natural born intuitive and empath who incarnated into this lifetime to bring forth ancient wisdom and knowledge and is a Certified Spiritual Hypnotist and contributor to their monthly newsletter "From the Desk of Patrick and Lisa Noland-Shalosky". Patrick's is also a contributor to the Bellesprit Magazine at www.BelleSprit.com under Spiritual Growth with his column called Patrick's Ponderance.